Call your best fishing buddies and drop the price of a full day float from $495/boat to an extremely reasonable, can’t be beat $395/boat this Spring! That is a total savings of $100/boat and a price of $197.50/person for a full day float trip! You would almost spend that much on flies, leaders, tippet, lunch, etc. doing it on your own. We provide all that for you not to mention an in-depth knowledge of the North Platte and the hardest working guide on the river. The total package equates to an experience you and your friends will be talking about for a long time! 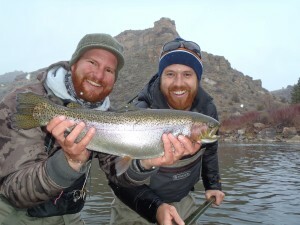 What is the Spring Fishing Like….